I’m not a big fan of over-generalizing the characteristics of the different generations in the workforce. It’s just too easy to say “Millennials are entitled;” “Baby Boomers aren’t good with social media;” or “Gen Xers are lazy.” Too easy, and not at all true. Any of it. So I read with some interest the results of a survey about the work habits of the generations that Paychex published last summer. 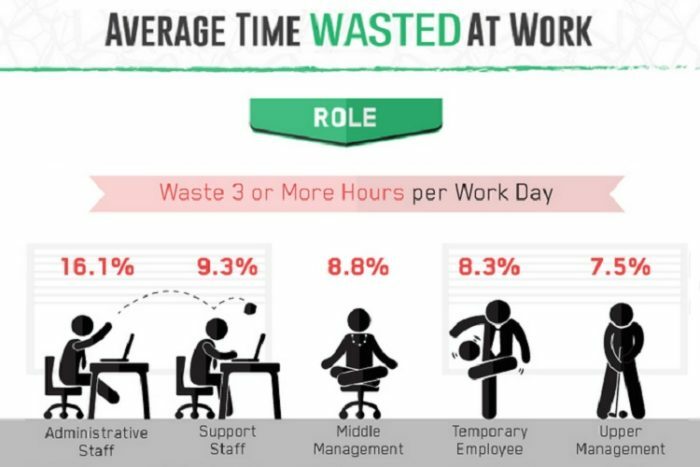 There are some interesting takeaways about who wastes time at work – and in what industries, geographic location, organizational role, exempt status and education level – in addition to the obligatory age demographic comparison. It’s interesting food for thought. Here’s one of the comparison graphics: This one compares time wasted at work by role, exempt status, and education. Industries that waste the most and least time surfing the Internet. Regions that waste the most time surfing the Internet at work. Hardest working generations, industries, and education levels. Hardest working regions in the U.S. If you have a sense that you’ve got a time-wasting problem in your organization, this information could be helpful as you work on a solution. If you’re interested in how the generations stack up in the “who works hardest” rodeo, you’ll definitely find this interesting.